What’s perhaps most surprising, and at the same time indelibly intriguing, about Sir Paul McCartney’s latest release Kisses on the Bottom, is, to be honest, that the ex-Beatle took this long to get around to releasing a collection of songs of this ilk, being the son of a big band leader as he was. McCartney sounds as comfortable as ever thumbing through the pages of the Great American Songbook, bouncing between lavish, orchestral arrangements (“More I Cannot Wish You”), wonderfully executed Fats Waller covers (“My Very Good Friend the Milkman,” “I’m Gonna Sit Right down and Write Myself a Letter”), and cleverly placed original works (“My Valentine,” “Only Our Hearts”), a pair of new tracks that feature guitar work handled by Eric Clapton and a tremendous harmonica solo from Stevie Wonder, respectively. 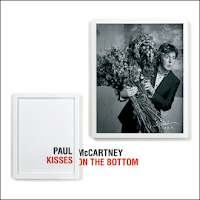 Kisses on the Bottom is an arena that McCartney settles into admirably, a setting which fits his skill set near perfectly at this point in his career. McCartney obviously handles these tunes with great care and utter love, which permeates each note emanating from Kisses on the Bottom, an album more than worthy of a handful of spins.